Preventative maintenance (PM) is taking precautionary and proactive steps against unscheduled equipment downtime and other avoidable failures. The purpose of the preventative maintenance is to institute scheduled inspections so that defects can be spotted before they evolve into something more severe. Therefore, it is important to complete these PMs and to complete them on time. Your preventive maintenance compliance (sometimes referred to as PM compliance or PMC) score is the percentage of scheduled preventative work orders that get done in a defined time interval. How do you measure preventive maintenance compliance? If you’re still using that old white board or those excel spreadsheets, it is next to impossible to get an accurate indicator of preventive maintenance compliance. Saying that, without a CMMS it is next to impossible to adequately track any maintenance metrics or costs. The easiest way to calculate your compliance metrics for preventive maintenance is using Fiix software. It is quite common for organizations to use the preventive maintenance compliance metrics to measure maintenance performance although PM compliance gets a mixed reception from operations managers. 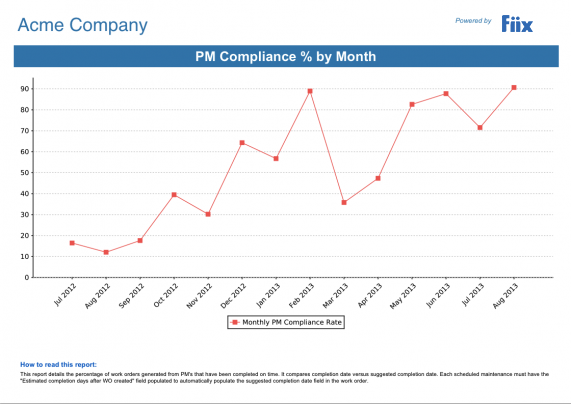 PM compliance could be 100% yet system downtime could still be a major issue. This is because the formula only measures whether the PM was complete or not, regardless if it was weeks late. Therefore, you should work to the 10% rule of preventive maintenance. The 10% rule states that a preventive maintenance action should be completed within 10% of the scheduled maintenance interval. For example, a quarterly PM every 90 days, should be completed within 9 days of the due date or it is out of compliance. The 10% rule helps keep your PM intervals constant, reducing the time variable variation, thus improving reliability. If done correctly, measuring preventive maintenance compliance and charting that against unscheduled breakdowns and costs is an excellent way to determine if your PM program is working for you or if it needs to be adjusted with either more frequent PMs or longer PMs to balance uptime, productivity, maintenance costs, reliability and asset life. There are many available preventive maintenance compliance reports in Fiix that take suggested completion date into account when calculating PM compliance. So, for a monthly PM, the technician should complete that PM within 3 days of the trigger date. The report will only mark that PM as compliance if it is complete, and secondly, if it is complete before the required date. When faced with a number of PM’s in the backlog, use the scheduled maintenance critical % to determine which PM to complete first. Scheduled maintenance critical percent shows how late your scheduled maintenance work orders are in relation to the maintenance schedule. See here for more info.